Like most kids in the 1980s, I loved video games. I started out with Atari, then moved on to computer games as I got a bit older. I remember some of my very early games came on big old black floppy disks. My dad, a teacher, would bring copies home his school. I would play the games every afternoon for hours and hours. 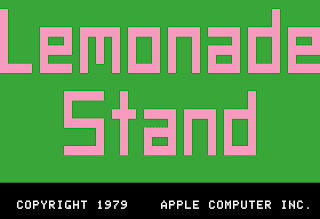 My other favorite game for the Apple II was Lemonade Stand. Lemonade Stand was basically a game that utilized simple math skills and strategy to earn money while advertising and dealing with the ups and downs of the market - in this case, rainy weather. 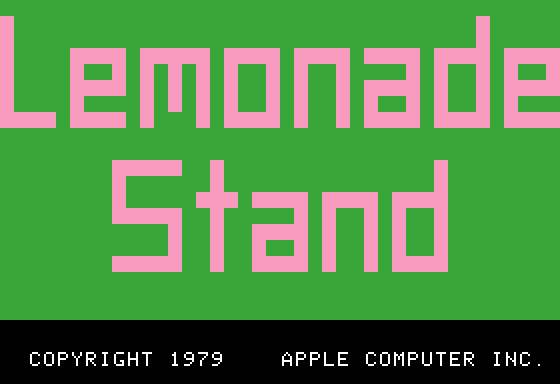 Watch the demo of Lemonade Stand for Apple II. I swear, the sounds will bring you right back. Love it! I totally agree that those sounds instantly transport me back to playing those games as a kid. I did not play a lot of computer games (compared to Atari & later Nintendo), but I do remember both of the ones you mentioned here. Not fond of lemon game but Olympic games was already a treasure for us kids of 90s. Nothing compares to the difficulties we've faced just to install the game but it was truly worth it. Compared to the high end games, the memories of playing retro games is truly timeless.